One of the things that you quickly notice when moving to New York is that all the women are immaculately groomed. Perfectly manicured nails/toes and impeccably arched eye-brows are the norm, rather than the exception. In fact, I am convinced that there are more nail parlors and waxing salons in the City than Starbucks stores - and that’s saying something! The “beauty” of them is that they are cheap. Whereas in London a manicure is a rare luxury costing north of $80, in New York you can walk away from any corner street nail salon with a perfect one for $15 at most, including tip. I didn’t give into the wonders of this ritual until quite a few months of living here. But a friend of mine suggested a girlie trip to our local salon once and I have never looked back since. The whole experience, even in what might look like a slightly run-down place, is pure heaven and I like the ritual as much as the end result. You first walk in and say what you’d like done to any of the ladies, who are usually busily attending to other customers. 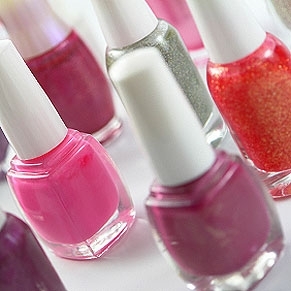 The wait is either nonexistent or very brief and you are told to choose from the vast array of nail polishes they have available on a high shelf (you can also bring your own). Upon sitting down at a small (but perfectly constructed for the purpose) table, your manicurist will carefully remove any previous polish, soak each of your hands in a warm soapy solution, apply a mysterious serum, push back and/or cut your cuticles as needed and proceed to cut or trim your nails to your desired shape. She will then apply a moisturising lotion (which has been warmed up in a special cabinet) to your hands and massage it only to then wipe it off afterwards with an even hotter towel - the most heavenly part of the ritual for me . After this, you will be asked to pay - this used to surprise me until I realised that you can’t reach into your purse with a fresh manicure. The polish application part can then commence with an undercoat, two coats of your chosen polish and finally a top coat being applied, after which you are taken to a drying station and given a brief (but wonderful) back rub while you wait. You will be left with nails more unbelievably perfect and polished than you could ever have imagined and thereby catch yourself admiring them at any given opportunity - like when you are grabbing on a subway pole while commuting, writing notes at work or even pointing at random things. It’s weird I know, but girls will understand me on this one. The whole process takes at least 45 minutes from start to finish and is therefore not something you can do if you are in a hurry. You have to build it into your schedule as I do now on a bi-weekly basis, usually on a Saturday morning after the gym but before brunch. I have come to consider it the best “me” time I can get. The only time when I am not checking my emails or talking on the phone. When I can truly feel disconnected from the rest of the world as I watch in absolute awe the expert skills of the manicurist tending to my nails, each coat of polish seemingly soothing my otherwise hectic mind. I don’t even have to talk as chit-chat is not really encouraged in such places. I have seen many women yapping on their phones while getting their nails done but I consider it to be rude to the manicurist and I prefer to sit there in silence, occasionally smiling and telling them what a wonderful job they are doing. I do however remember a conversion with a girl who was giving me a pedicure once and told me that in her country looking at feet, let alone touching them, was forbidden and that she cried the first time she had to do it. This only made me more respectful (and guilty) of the work they do so skillfully and perhaps unwillingly do to make ends meet. I always tip generously to make up for it - my lowly contribution to a strange system, I realise. I have yet to indulge in eye-brow threading - a practice that still instill incredible fear in me, not lessened by the fact that every eye-bow threading shops in the City advertise their services by playing a constant loop video of said procedure in their store window for every passers-by to see. They make it look painless and almost pleasurable. I don’t believe them. Oh my god, there is a nail place just outside our apartment and I've never bothered to go in as I too figured it would be expensive. Thank you for clarifying. I was planning to do my fingers and toes this weekend, but now I wont bother!